A The src sub-directory contains the production code to be tested. This directory contains the .qm model file as well as the generated code from the model. 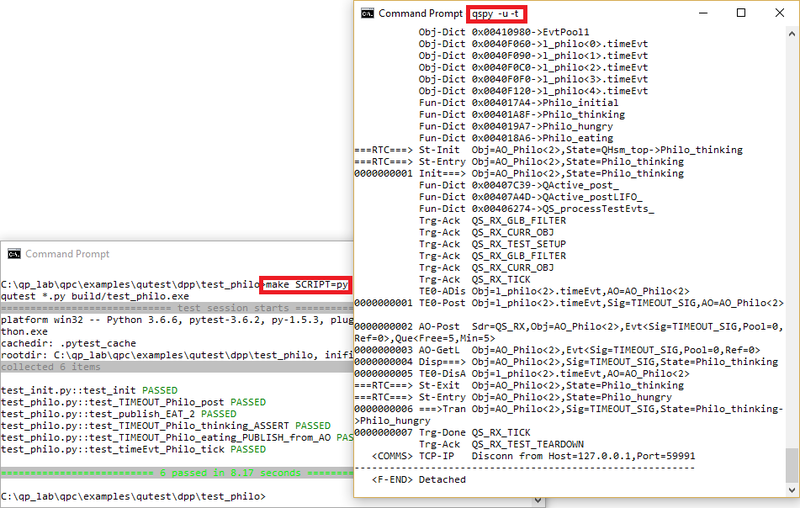 B The test_philo sub-directory contains the unit test code for a component, such as Philo in this case. Here, you can find the test_*.c test fixture, the test scripts test_*.tcl (Tcl) and test_*.py (Python) as well as the cross-platform Makefile to build the code and run the tests on the host. C The test_dpp sub-directory contains integration-test code for the application, such as DPP in this case. The objective is to test the initialization and interactions among components. Here, you can find the main.c main() function as well as the test_dpp.c test fixture. This directory also contains make_* makefiles to build and run the code on the embedded targets. D The target_efm32 sub-directory contains the Code needed to build and run the test code on the embedded target, like EFM32 in this case. As usual in Test-Driven Development (TDD), the provided Makefiles both build the code and run the tests. Typically, you start testing on your host computer. Before building/running the code, you need to open a terminal window and launch the QSPY host application with the -t command-line option. The QUTest testing system allows you also to easily test the code directly on the embedded target board. 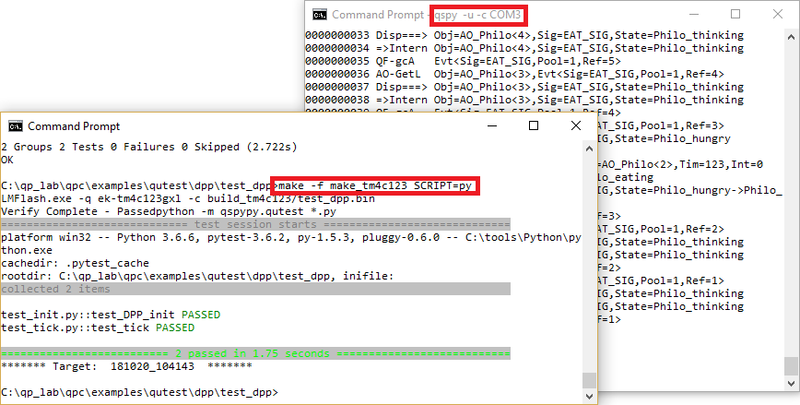 The dpp/test_dpp/ directory illustrates this option by providing the makefiles for embedded boards, such as the TM4C123 (Tiva LaunchPad) make_tm4c123. To test the code on an embedded board, you need to connect the board to the host computer and launch the and launch the QSPY host application with the -c COM<n> command-line option, where <n> is the specific COM port number on your host that the board is using.